I have mixed feelings regarding Bluetooth (BT), based on varying rates of success with devices that use this new wireless technology. But when BT works correctly, the results are impressive, although sometimes requiring a bit of fiddling. Such is the case with MacAlly’s attractive, versatile Portable Bluetooth Optical Mouse (PBOM). You should use rechargeable AAA batteries, like the pair that is included in the package (or throwaway non-rechargeables when charging is not an option). Then you need to recharge PBOM in its custom cradle for several hours until its green light goes away. Then you have to use OS X’s BT Setup Assistant to get the mouse to communicate with your Macintosh, and press a little button on the bottom of PBOM to activate the connection. Fortunately, everything works as advertised, and, battery-charging time aside; the process is straightforward, if not intuitive. Bonus: several pairs of AAA rechargeables can be handy in briefcase or backpack, thanks to MacAlly’s included charging cradle. Note: each time a Bluetooth mouse kicks into gear following sleep or restart, it’s normal to experience a one-second delay from initial mouse movement to screen cursor action. My heavyweight G5 doesn’t have a built-in BT module, so MacAlly provided an external USB Bluetooth Adapter (UBA), which is available for $39 at http://www.macally.com/spec/usb/input_device/btsync.html. Good news: ignore the included CD that is in the UBA package, because OS X Panther activates BT simply upon insertion of this adapter into your Mac’s USB port or powered USB hub. Speaking of packaging, here is an observation, not a complaint. MacAlly, in their retail wisdom, chooses to encase both mouse and adapter in nearly bulletproof plastic. The overkill factor is not the worst I’ve encountered, but it’s a close second. Can package designers contend with possible theft without having to drain the Alaska Wildlife Refuge or the nation of Quatar of their remaining precious few zillion barrels of crude oil? With adapter plugged in and charged mouse operative, I’m using PBOM exclusively during this evaluation period. Compared to my G5’s basic white Apple mouse, tracking is a bit less smooth, but just as accurate. The more I use PBOM the more accustomed to it I am, so that after a few hours I’m not conscious of any deviation from the norm. Being a full-sized mouse person, PBOM’s compact size (approximately 2/3) is not my first choice, but it will come in handy when traveling or tutoring a person with a more petite hand than mine. Children and people with smaller hands will probably think this mouse is just right, without any hesitation. MacAlly’s three-year warranty is generous, and the $50 price tag is consistent with other comparable products. The UBA costs an additional $40, and must be ordered separately when computers don’t already have BT capability. 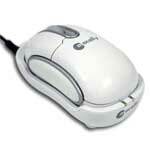 This is a two-button mouse plus scroll-wheel, adding enhanced function to ordinary mousing. Once you get into the right-click and/or finger-scroll habit, you’ll be hooked, I predict. PBOM has cushioned pads on either side, for extra comfort. Altogether, it’s a well-engineered, full-service portable USB wireless mouse that will provide years of service under ordinary conditions. Whether PBOM is “the ultimate mouse for working professional” is to be determined after I take it on the road for a month, so please check back with me in May if you want an update. Bluetooth has a distance advantage over portable USB devices, and PBOM does its magic from across the room. Additionally, only one built-in or accessory BT module is required to communicate with multiple BT devices, unlike USB wireless peripherals that usually each come with a unique transceiver. If this feature or any of the others mentioned above are important, you’ll agree with our favorable rating of 4 out of 5. MyMac.com Acquired by Apple Computer, Inc.